We spent our last night in Tokyo cruising the streets in Tomo’s Citroën. 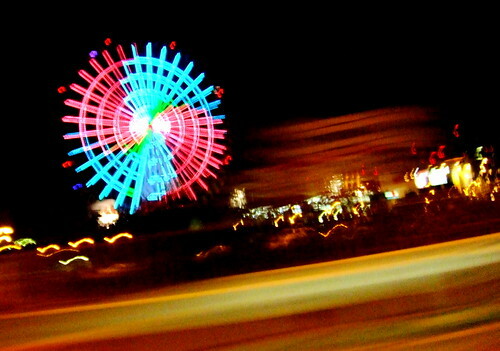 It’s been a long time since I’ve cruised in a car with friends, doing not much but just listening to music and talking and moving from place to place. In Japan I almost always use public transportation, and even when I do take a cab it’s not in any way similar to bumming along roadwise with your comrades. I had never really realized what a specific feeling is embodied in the act of private road traveling; its a sensation that combines the closeness of conversation and body proximity with the floating feeling of a disembodied landscape that passes by like ghost water. In California it’s so everyday that it defines life, but in the year and a half since I’ve been in Japan, this is the first time I’ve traveled like this. Of course, we weren’t just cruising, but going from place to place on agenda too. 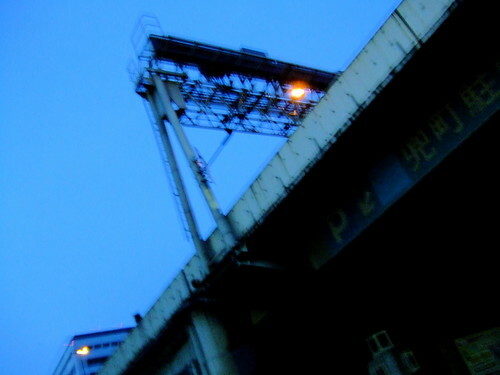 We stopped at Autobacs, the enormous Tokyo autoparts emporium, and we spent time cruising the not microscopic hop-up parts area. There’s also a bookstore dedicated to automobilia (and some motorcycolia too) and we took our time there, leafing through the history of motorsports. Tomo picked up a couple of vintage racing videos (Monaco, 1967! — or something of the sort) and then we headed out, ending up at Jojoen, a classy yaki-niku (grilled meat) restaurant on something like the 50th floor of a skyscraper. We received plates of fresh beef (no American beef yet) and grilled it up at the table while looking out at the night view below. Yaki-niku has grown incredibly popular in Japan (you can think of it as Korean BBQ without the spice) and there are yaki-niku restaurants all over the place. It’s the communal cooking involved in yaki-niku that makes it fun and exciting — you talk while you cook, and when the food is ready, you serve it all around. Japan also has a remarkable system for tracking beef. Individual cows are numbered, and their meat is tracked by number. If there is an outbreak of e. coli the source of the meat can be immediately tracked. The three cows they were serving while we were there were all listed by and sourced by number on a menu outside the door — our beef had established provenance. 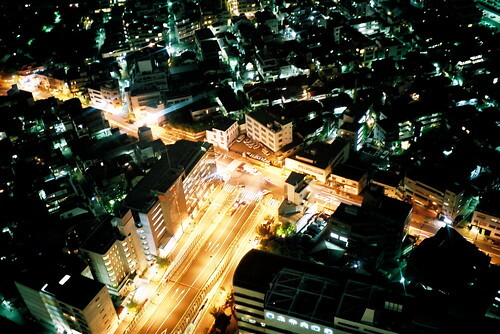 View of Tokyo from Jojoen. 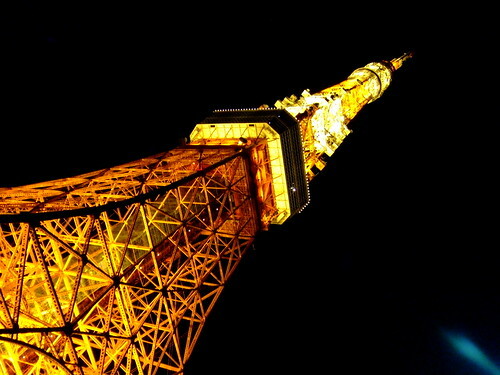 Of course, it’s not an evening in Tokyo until you’ve driven by the Diet building and then through some back streets until you’re right up under Tokyo Tower at midnight, surrounded by its overwhelming sense of orangeness. I’ve thrown a couple of unrelated images into this entry as well. After all, “desultory” is the theme, right? 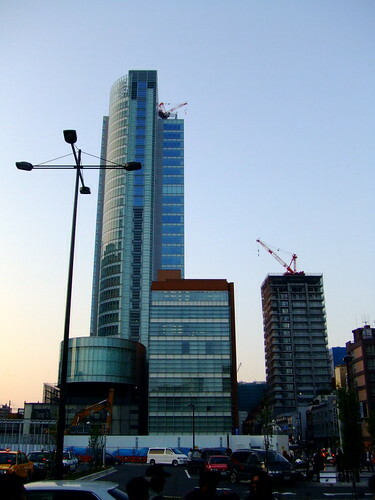 This is a series of buildings that is going up near Akihabara. Will it come to be known as “Aki Hills”? Tommy Lee Jones shills for Boss coffee. 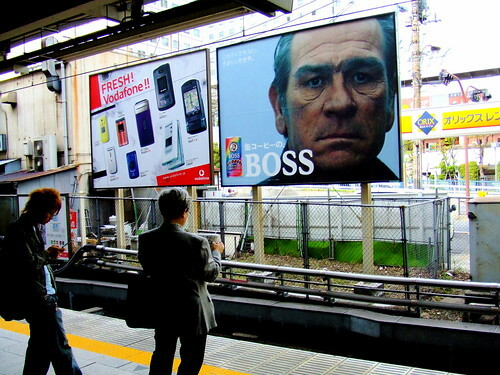 This advertising campaign holds a mysterious semiotic power, as far as I’m concerned — probably having to do with the proximity of the word “BOSS” and Tommy Lee Jones’s hard-lined, world-weary face. I don’t know where Boss coffee gets its name from, but their logo is the mustachioed image of a man that looks remarkably like Stalin. When the J. was visiting she got into the habit of referring to him as “The Dictator,” and ever since then I’ve had trouble not thinking of Boss coffee as Dictator coffee.